Facebook shows notifications at the top left section when any of your friend comments on your status, likes your picture, tag you etc. If you are getting too many unwanted notifications from any particular friend, than their is an option in Facebook "Get Notifications" which you can disable for that particular friend in order to stop receiving the notifications for their every activity at Facebook. With the same option you can enable to receive notifications from your friends for all of their activities at Facebook. 2. Type your friends name at the search bar, for whom you want to receive or disable notifictions. 3. Click his / her name to open their page. 5. 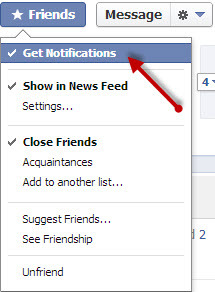 Now, if you want to receive notifications from your friend for all of his / her activities at Facebook, than just Click Get Notifications option or If you don't want to receive notifications from him / her than uncheck the Get Notifications option.